Blackberry cane and leaf rust (Kuehneola uredinis) occurs on some blackberry cultivars, specifically ‘Chehalem’ and ‘Evergreen’ blackberries. In addition to blackberries, it may also affect raspberry plants. Rust in blackberries is first observed in the late spring and is favored by wet weather. 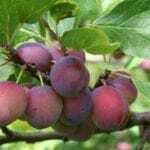 While this fungal disease is not usually severe, it can affect the vigor of the plant and while it doesn’t infect the fruit, spores drifting onto the berries can make them unsightly and for the commercial grower unmarketable. As mentioned, the first sign of blackberries with rust occurs in the late spring and appears as large yellow pustules (uredinia) that split the bark of fruiting canes (floricanes). The canes become brittle and break easily. From these pustules, spores burst forth, infecting leaves and producing smaller yellow uredinia on the underside of the foliage in the early summer. If the infection is severe, defoliation of the entire plant may occur. Buff colored pustules (telia) develop among the uredinia in the fall. These, in turn, produce spores which infect leaves on primocanes. 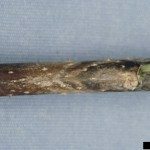 The fungus that causes rust in blackberries overwinters on canes or lingering uredinia. Spores are spread via wind. Blackberry Kuehneola uredinis is not to be confused with the more damaging orange rust. Orange rust results in orange pustules on foliage only rather than yellow pustules on both canes and foliage, and orange rust in blackberries also causes small, frail shoots to grow from the base of the plant. A combination of cultural controls combined with the use of fungicides is the best course of action to control blackberry Kuehneoloa uredinis. Remove and dispose of fruit canes as soon as possible after harvest. Organic control after removal of the canes involves sprays of lime sulfur or fixed copper. 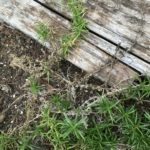 Apply lime sulfur in the winter followed by an application of fixed copper at the green tip stage and again just before the plants bloom. For susceptible blackberry cultivars, apply protective fungicides prior to any sign of the disease.